Planning your idea kitchen in Colorado differs slightly from year-round warm climates. Colorado’s warm days, cool nights and extreme winter temperatures can affect the finishing materials as well as the outdoor appliances and outdoor cabinetry choices. When the snow starts to melt in Colorado, water starts accumulating in and around built-in grills and outdoor kitchen equipment, and our cold winter nights cause freezing and expansion. 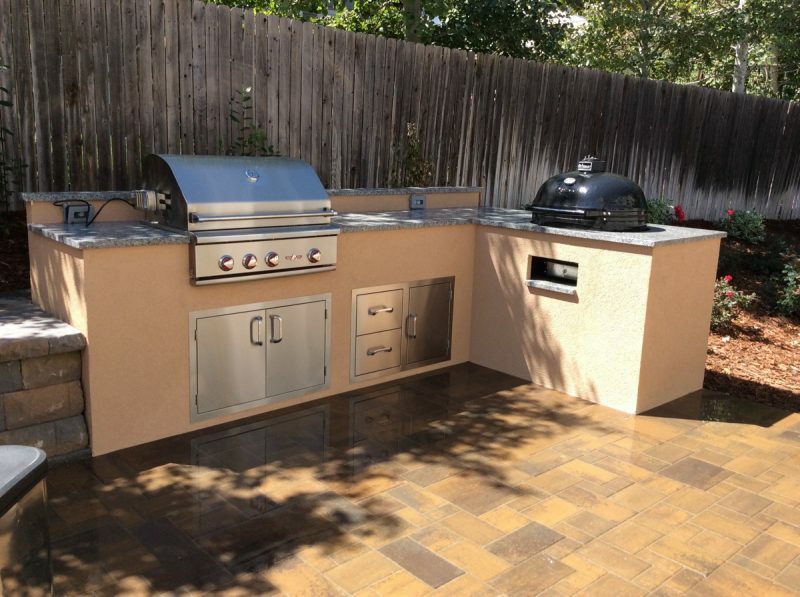 Picking the right outdoor kitchen design for Colorado is important as selecting the best outdoor kitchen countertops and cabinet facing material for the constantly changing temperatures. Here are some add-ons for your next outdoor kitchen. Enjoy that fresh-out-of-the-oven taste. Setting a warming drawer in your outdoor kitchen makes it easier to serve all your food at the same time. Cabinetry that resists water will make your outdoor kitchen last longer and look great for years. 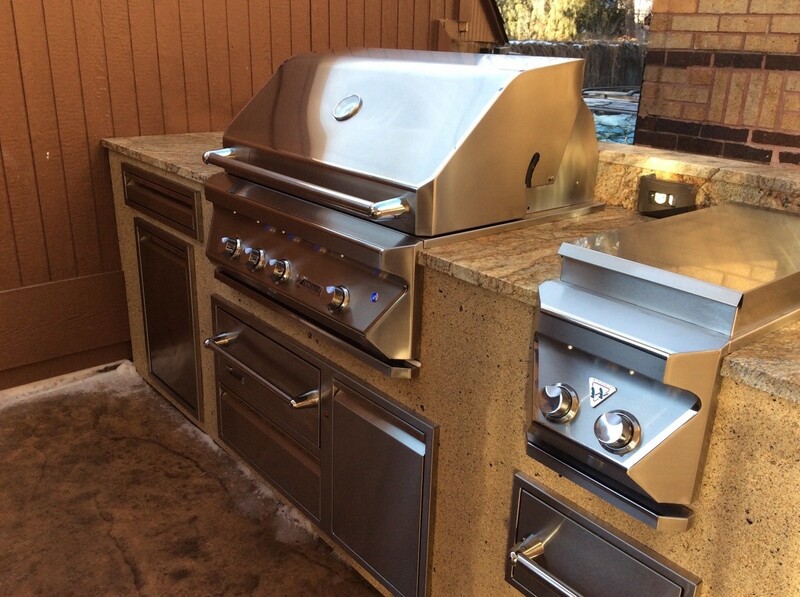 If grilling is one of your top favorite outdoor activities, a built-in grill on your patio or in your yard is for you! 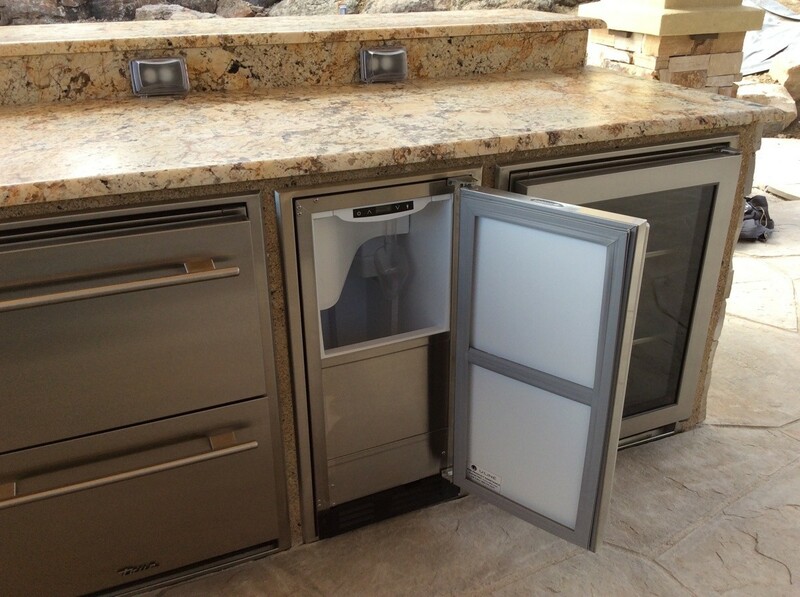 Add the ultimate touch to your outdoor kitchen with the ability to serve ice-cold beer. Outdoor beer dispensers are a convenient choice, especially during those sunny days in the summer. You may desire more performance that top-notch grills provide, like high-temperature searing, sear zone burners, halogen lighting, self-cleaning grills, spring assist lids, reliable ignition, and rear rotisserie. Twin Eagle grills even offer charcoal cooking accessories, smoker boxes, and stainless steel griddles. Hi-Tech Appliance offers outdoor warming drawers, outdoor weather-proof refrigerators, beer dispensers, and a broad selection of stainless steel doors, drawers, and weather-resistant storage components. If you need side burners, built-in smokers, outdoor blenders, and even outdoor sound equipment, Hi-Tech Appliance in Louisville on McCaslin Blvd. has all outdoor kitchen appliances with many, many options. Call us at 303-665-0951 now!